MHRD Recruitment 2016 Ministry Of Human Resource Development (MHRD) Recruitment Notification has been Publish on their official website: www.mhrd.gov.in Candidates is hereby notified that they can submit their application to MHRD on or before last date of Application. As per The official advertisement of MHRD, near about 12 Director Post will be filling up by Ministry Of Human Resource Development. Last date for Application 01st August-2016. MHRD Recruitment 2016, Eligible candidates are required to visit official website which we have mention earlier. 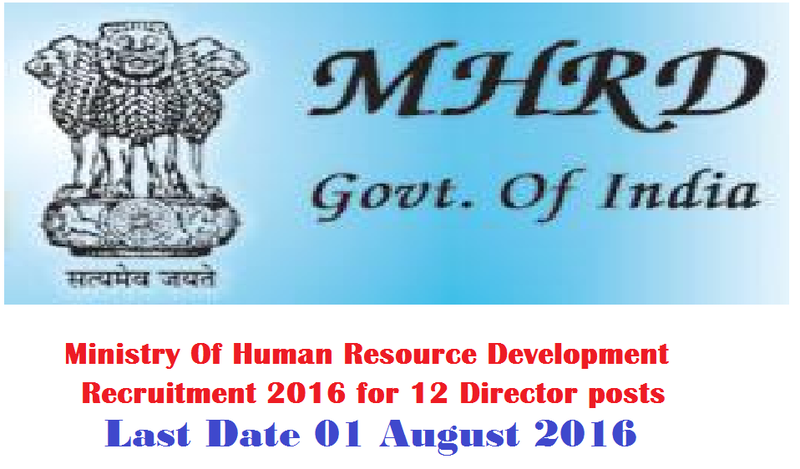 You should aware of all the process of Ministry Of Human Resource Development Recruitment 2016 like MHRD Eligibility criteria, Selection process, age limit, Application process, Examination fees last date of application etc. MHRD Recruitment (Ministry Of Human Resource Development) recruitment is mainly for the applicants of Delhi, We have tried to give you all the vital information of this recruitment. For being double sure about the information, you should not forget to download the official advertisement. We have mention a download link of original advertisement bellow and it is totally your responsibility to view . Salary Offered:Rs. 75,000/- plus Special Allowance of Rs.5000/‐ p.m.
Age Limit:Ministry Of Human Resource Development MHRD Recruitment Age Limit. Candidates age should not be more than 65 Years. Age Relaxation will be applicable as per rules .More details on advertisement. Ph.D. Degree with Bachelor/Master Degree in Engineering / Technology or its equivalent qualification from any Recognized Board or University. Application Procedure / How To Apply? Applicants may Download MHRD Application form from official website www.mhrd.gov.in. Send it to the Following address (listed below). Application must reach on or before 01st August-2016.